With birds chirping and flowers blooming, it’s time to give your tastebuds a break from heavy winter flavors and experience some lighter food. My pistachio – apricot biscotti is perfect in the morning alongside a cup of joe or enjoyed as an evening dessert. I use honey for a natural sweetness that pulls all of the spring flavors together. 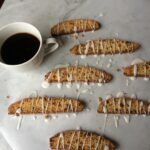 This biscotti is perfect on its own but sometimes I like to kick it up a notch for an evening snack by drizzling some simple vanilla bean icing over the top. Prepare a baking sheet lined with parchment paper and set aside. In a large bowl, combine eggs, honey and sugar. Beat on medium speed until light in color and consistency is thick. Beat in extracts and lemon zest on low until combined. Add dry ingredients and beat until incorporated. With a wooden spoon, stir in chopped nuts and fruit. The dough should be soft and very sticky. Remove dough from bowl and transfer to prepared baking sheet. Form into a log about 10 inches long and 3 inches wide. With damp fingers, gently smooth the top of the log. Bake for about 30 minutes until lightly crisp and golden brown. Remove log from oven and reduce temperature to 300°F. Allow to cool on sheet for 10 minutes. Transfer log to cutting board. With a serrated knife, cut log diagonally into ¼—½ inch thick slices. Transfer slices onto sheet pan and bake for 15 minutes. Flip slices and bake for an additional 15 minutes. Store in an airtight container at room temperature for up to 2 weeks or double bag and freeze for up to 6 months. For the vanilla bean icing I combine powdered sugar, water or milk and vanilla bean paste. You will not need much liquid, add it by teaspoon until you get the consistency you prefer. If you cannot find vanilla bean paste substitute vanilla extract or any other flavoring you have on hand. I also like to use orange and almond extracts for a variation.